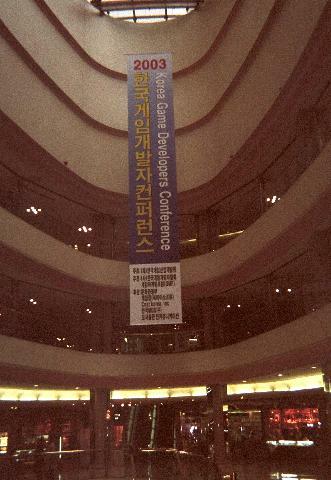 The 2003 conference was held at the Lotte Hotel in the Jamsil area of Seoul. The hotel is interesting in its own right. 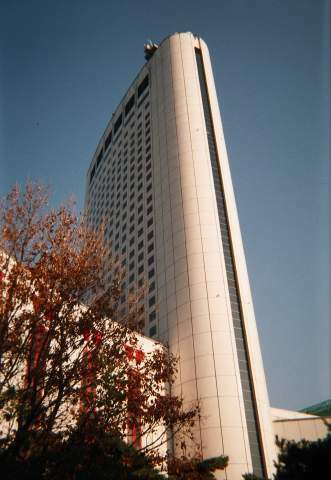 The hotel takes up a very large city block and includes a department store and an amusement park called Lotte World. 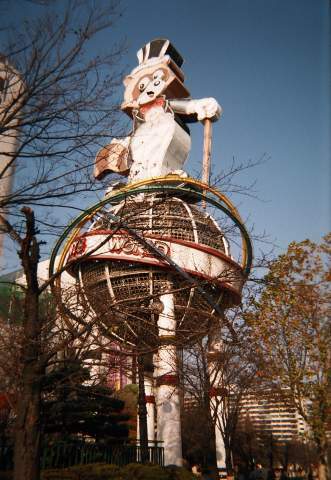 This is the park's mascot. Part of the park is outdoors, jutting into a manmade lake. 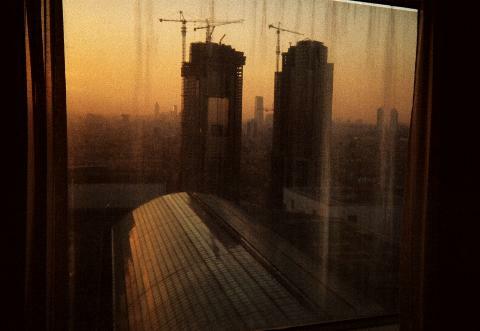 This is the view from an external hotel elevator near my room on the 23rd floor. 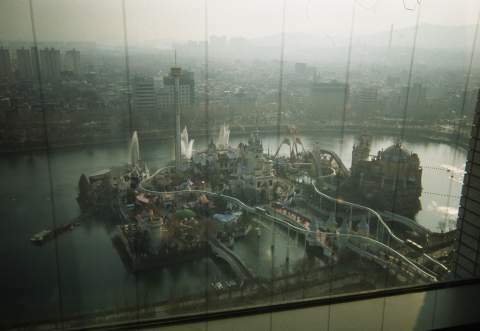 Another part of the park is indoors, including rides and an ice skating rink, beneath the huge domed roof visible below my window. 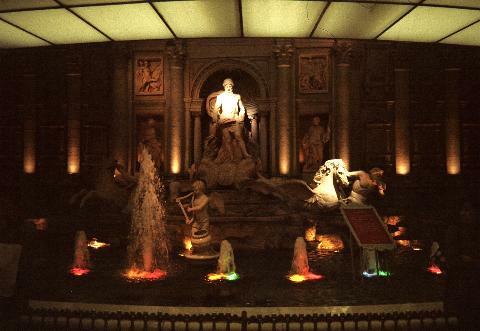 And down in the basement, above the subway station, is a fancy Grecian (or is it Roman) fountain. 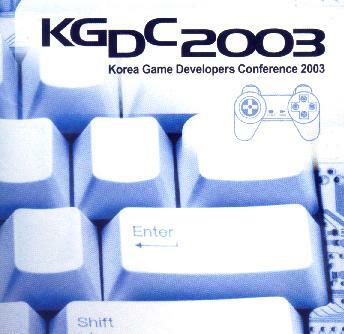 Here's a shot of the KGDC sign hanging in the hotel lobby. The conference took place up there on the 3rd floor. My apologies for the picture quality. 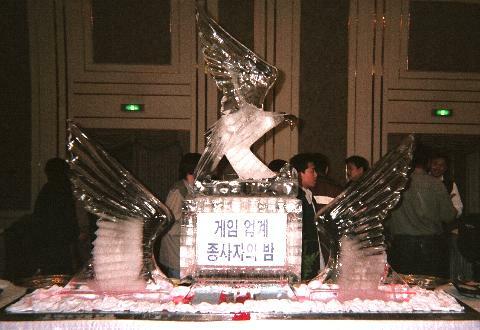 I stupidly forgot to take my "dica" (current Korean slang for "digital camera") on the trip, and had to make do with those cheap disposable cameras, which don't handle available-light situations as well as my dica does. Group shot of several of the conference speakers. 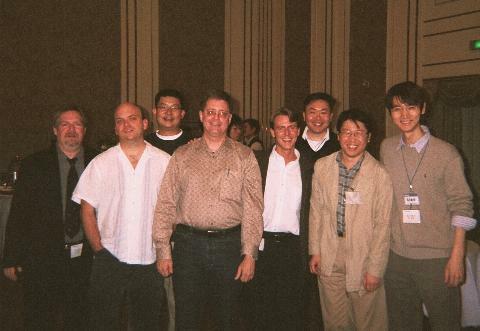 Left to right: Steve Gray (EA), Erik Bethke (Taldren Korea), Thomas Lee (Megsquared), me, Skip McIlvaine (Microsoft), Young Hui (Gameup), Gi Uk Lee (Game Academy), and Andrew Jung (KGDA). 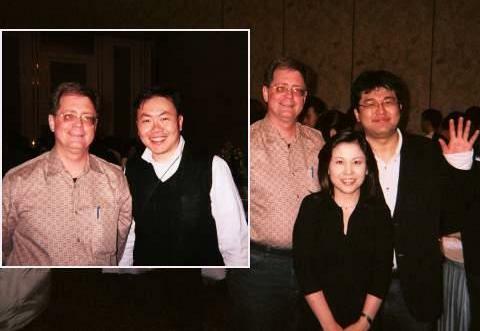 Left - John Song works for the Korea Game Development & Promotion Institute (part of the Ministry of Culture & Tourism). He's the one who got me onto the speaker list and flew me over to Korea. Right - Andrew Jung is president of the KGDA. Left - Young Hui is CTO for Gameup China. Right - Yuko Okabe of Metrowerks, and Kiyoshi Shin of IGDA Tokyo chapter. Shin-san gave me a copy of his book, a postmortem of a samurai game project. Oh, I suppose I ought to say what my speech topic was. My talk was entitled "Striking the Balance," and examined the pros and cons of the two major game design philosophies (A - designing a game fully before starting to work on it, and B - designing as we go). You can download the Powerpoint file here. 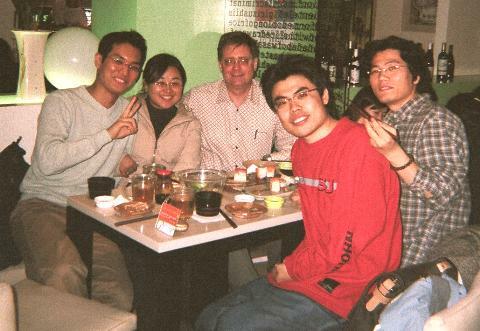 The last night of my stay in Seoul, I had a pleasant dinner outing with a group of game designers. 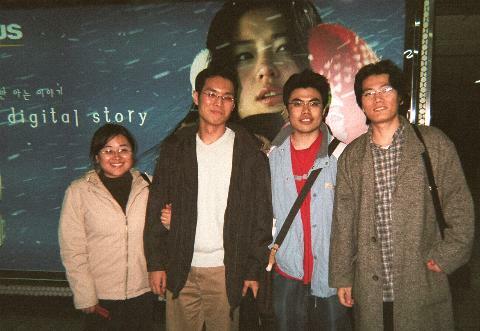 Left to right: Taesun Yeom (Game Designer/Planner, Daum Communications), Earny Park (Game Designer, Gravity Software), me, Heung-Ki Kim (Game Designer, Daum Communications), Jee Eung Jung (Designer/Developer, Com2us). Several of the members of this group are into table games as well as electronic games - something that can be said of relatively few aspiring game designers in America (who seem to be interested exclusively in electronic games, sadly). The location: "Raw," a restaurant specializing in American style sushi. After hitting another place for a drink, the group said our goodbyes in the subway station, each to go in different directions. Heung-Ki Kim rode with me most of the way to my stop, and we had a nice chat on the train. 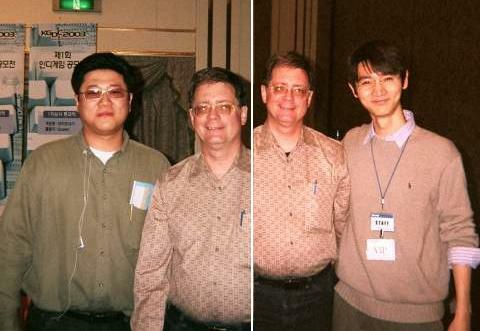 Special thanks to Taesun Yeom and John Song, without whom the Korea trip never would have happened! Copyright 2003 Tom Sloper. All rights reserved.